When you’re talking about the best Windows VPS Hosting, you’re referring to a Virtual Private Server that runs Windows Server OS for you. Many people go for Windows VPS Hosting because it’s reliable, versatile, complex, easy-to-use and pretty cheap. Big organizations specifically make use of Windows VPS’s to create unique and personalized virtual desktops which act like any desktop on a regular computer to run their applications. The difference is that, by doing so, they save a lot of money on power bills. From a cost-effectiveness standpoint it’s obviously better to host and run your applications on the cloud rather than your physical computer. Other usages include but are not limited to: hosting game servers, Forex applications and robots, serving as a backup storage server or even to resell hosting to your own customers without actually owning a datacenter. In the next part of our review, I’ll be talking about a few Windows VPS hosting providers. Before doing so, I’d like to quickly teach you how to connect to your Windows VPS. 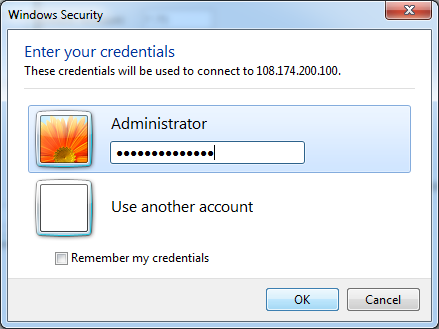 You can do so via the Remote Desktop Connection feature provided by Microsoft. You don’t have to download any software, it’s all in your computer. Here’s what you need to do. 1. 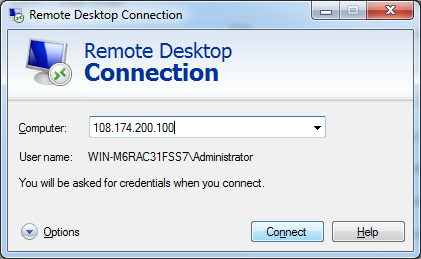 Open Remote Desktop Connection (Type “RDP” in your Start Menu Search Box). The following window will appear on your screen. 2. Enter the server’s IP Address provided in your Welcome Email. Then click connect. 3. A separate window will pop up. For the username, type Administrator. For the password, type the one that has been provided in your Welcome Email. If the provided information is accurate, you should see the remote window of your server. Good job! Below you can find the compiled top 16 list of webhosts that provide the best Windows VPS providers on the market. Let us begin. Having servers based in the US and multiple European countries, Qhoster.com is among the best Windows VPS Hosting providers that you can find on the market. They have been around serving numerous repeat clients since 2004, growing into a reputed business appreciated by many. ✓ Price/quality ratio is great. ✓ A plethora of server locations to choose from. ✓ They have been around for nearly 12 years, which speaks for itself. ✘ Technical staff reportedly takes long to respond to queries. As a general rule, companies that have successfully stood the test of time make for great choices, and Qhoster.com is no exception. While I’m not necessarily keen on the lack-of-refund-policy aspect, it’s certainly outweighed by the aforementioned advantages. If you’re passionate about Forex Trading, you have probably stumbled upon the right Windows VPS Hosting provider for you. The folks at PhotonVPS.com ensure that your trading platforms, along with your binary option robots, are hosted on state-of-the-art servers, located in an immense datacenter based out of Los Angeles, California. ✓ Very transparent about their pricing. ✓ Considerable discount on their last plan. There aren’t many hosts out there that offer Forex Windows VPS Hosting, but the few that do usually provide great services. Specifically, PhotonVPS.com provides abundant features on each plan for a really great deal. ✓ Very fast customer support – they usually reply within minutes to tickets. ✘ Not very transparent about what they offer. ✘ Unpolished English, which makes it hard for speakers to understand. I’ve contacted their customer support about some of the plans they are offering and a representative got in contact with me within seconds on live chat. While he was certainly not the best English speaker out there, he managed to get the point across. Responses also seemed “canned”, but it didn’t bother me too much. ✓ VPS plans priced as Shared Hosting Plans – nice! ✘ Minor “hiccups” every now and then. ✘ Only one server location in Europe. I’m impressed by the prices, but unfortunately I could not find much information about the company except for the server location. Their refund policy is also rather unclear. ✓ Multiple types of Windows VPS Hosting. ✓ Over 10 years of experience. ✘ A few upsells here and there. ✘ Customer support is reportedly slow. Speaking from experience, I can safely say that the company is reliable. However, do pay attention to the frequent upsells that you’ll encounter on the way. In other words, focus on pragmatic features (RAM, Storage, Bandwidth etc.). Other than that, they’re definitely to be considered. ✓ Transparent about their business. ✘ Customer support is reportedly great, but doesn’t get involved too much. Given that the company is rather new on the market, I didn’t expect to find much information about them. I was proven wrong. On the other hand, they are straightforward about their windows VPS offers as seen in the pricing lists above. ✘ Seems to be a reseller. If you often pay with your credit card online, you won’t have problems with this webhost. However, for those among you who prefer other payment methods (PayPal, Bitcoin etc. ), they do not accept them unfortunately. ✓ Have been in business since 2003. ✓ Multiple VPS plans to choose from. ✘ Lack of price transparency – subscription prices are either “promotional” or “available on annual signup only”. I dug up for some more information about their company and was pleasantly surprised to find an immense knowledgebase revolving around webhosting instead. If you opt for their services, you won’t really need to resort to their customer support. ✓ Pretty cheap considering the features. ✓ Virtual Private Servers are either HDD or SSD-based. ✘ I had to search a while for the pricing list. They take pride in being featured on websites such as Forbes and Inc., but I couldn’t really find something consistent to prove it other than a few quotes on Forbes. Other than that, their business practice seems ethical. Miscellaneous reviews also suggest that migration to their servers is free, although I couldn’t find this information anywhere on their website. They also appear to be resellers. ✓ Multiple US server locations. ✓ Transparent about their pricing. ✘ No international server locations. ✘ VPS hosting services only – it may or may not be a disadvantage. Each plan comes packed with many features, and the price can be easily overlooked for each apart. Given that they’re a rather fresh company, they have yet to make a reputation for themselves, but I believe they’re worth your consideration nonetheless. ✓ All customers are backed up by a comprehensive SLA. ✘ Not much information about the company. It’s not the plans or prices that struck me, but rather the aforementioned SLA. These are usually found with the typical GoDaddy or HostGator webhosts, so I was naturally surprised. Although they’ve been around for quite some time already, they are not very transparent about their company whatsoever. Compared to other webhosts, the pricing is rather high, but there are also many more features to compensate for it. Dotblock.com have been around since 1999, hosting over 50,000 websites to this day. They mainly specialize in SSD and Managed VPS Hosting. In contrast with our previous entries, Dotblock offer custom plans, meaning that they enable you to create the plan that suits your specific needs. The cheapest price starts from $9.95. ✓ Very good looking presentation website. ✘ Custom plans might not be advantageous to everyone. I haven’t really stumbled upon many webhosts which offer custom VPS plans, so I’m pleasantly surprised. Topped off with their apparent experience in the industry renders them a reliable choice. ✘ Not many ways to get in touch with them, other than e-mail and telephone. ✘ Germany server locations only. The website itself seems pretty outdated, but still manages to maintain a rather professional look. There are also many other hosting plans to choose from, so you may want to check them out. The lack of live chat support is quite disappointing, considering that it’s an industry standard nowadays. ✓ Prices start from $3.99 per month only. ✓ Multiple ways to get in touch with them. ✘ Little to no information about their server locations. While the 99.8% uptime guarantee might raise some eyebrows, I personally believe that it’s a very realistic guarantee. Do those who guarantee 100% website uptime not carry out any server maintenance? Highly unlikely. ✓ Lots of features to make use of. ✘ No obvious things to say here, other than the website could be refined in some parts. While the “unmetered” bandwidth feature sounds cool, it doesn’t really mean “unlimited”. If you use up too many resources, or in our case bandwidth, you still put your account at risk of being terminated, so be careful. Those among you who have had this feature on shared hosting plans know what I’m talking about. 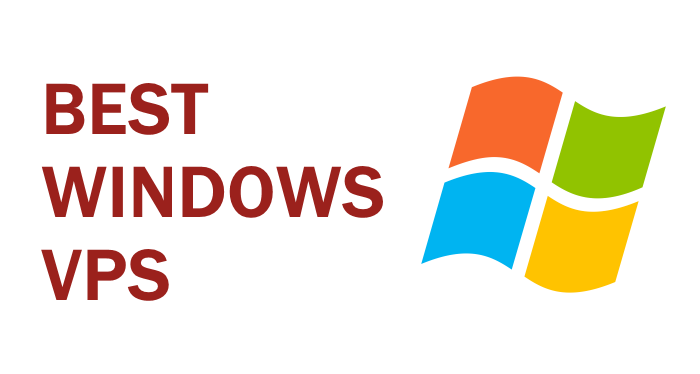 This was a list on the best Windows VPS providers on the Internet. ✓ Privately owned – no resellers. ✓ Located in central Europe. ✓ Very high port speed. ✘ The prices are higher, virtually anything is allowed on their servers. Their VPS’s are instantaneously setup. Furthermore, they accept Bitcoin and encourage their clients to take any steps necessary to remain anonymous. This is the best option if you’re looking for full security and privacy provided by a host with a flexible attitude.